Available space is premium at any educational establishment, and at Dulwich College they found an intelligent way to transform a waste area – sandwiched between two music department blocks – into a new location for a Drum & Band Practice Room. The Music Practice Room had to be designed to reduce sound transmission well beyond BB93 thus allowing drum practice all through the day without interfering with other music lessons. 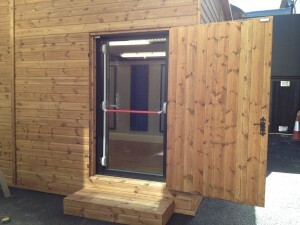 Amadeus successfully installed an Acoustic Pod, ideal for music practice, into a shed. A floating floor was laid onto rubber strips, to cut out any floor borne transmission. 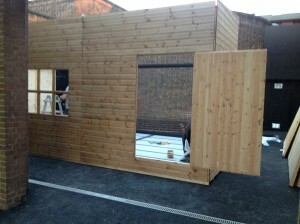 Both the window and exterior door were aligned to match the Pod’s acoustic window and fully glazed 48dB acoustic door. The step was formed from matching wood and the whole structure formed from tanalized wood was then stained in-situ. 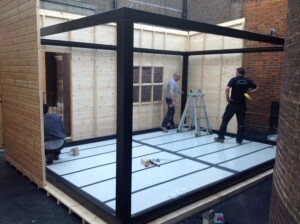 None of this would have been possible without the Dulwich College estates department ensuring the whole area was resurfaced, in the centre of which they installed a concrete raft where the shed was positioned. Their design included rain water gulleys to link to our guttering and down pipes. The project, from arrival on site of the shed and Pod materials, took 4 working days to complete including all electrics, light, power and attenuated air-exchange system, plus laminated floor finish and all acoustic correction panels. The internal acoustics can be individually changed to be more absorptive or more reflective depending on how the user prefers their environment. 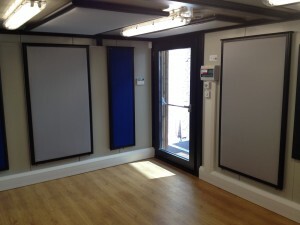 The panels are reversible to offer a more personal choice of the acoustic experience. 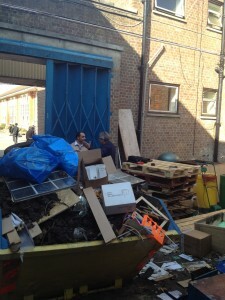 Many thanks to Dulwich College for featuring in our Case Study.